Lamberts was one of the first companies to produce probiotic capsules in the UK (over 20 years ago) so we know how to do it properly. Which is why an independent study found our product was one of the few tested that contained what was claimed on the label. 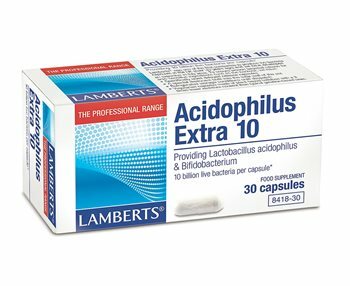 Our products are milk free; and contain two carefully selected strains of friendly bacterial Lactobacillus acidophilus La5 and Bifidobacterium Bb12 both of which have been widely used in clinical studies. Capsule Shell (Hydroxypropyl Methlcellulose, Colour: Titanium Dioxide), Dextrose, Bacterial Culture (providing Lactobacillus acidophilus La5 and Bifidobacterium Bb12), Potato Starch, Cellulose, Magnesium Stearate. Take 1 capsule daily, or as directed by a practitioner or pharmacist. Take with a glass of milk or water or with a meal. Do not swallow capsule with hot drinks, heat kills bacteria. Do not exceed recommended daily dose. Lamberts has developed some of the best natural supplements on the market. Acidophilus Extra 10 is a very good example of this. Today I receive my first order. I am very satisfied. Thanks Healthstuff. As good as the first time. Highly recommended.